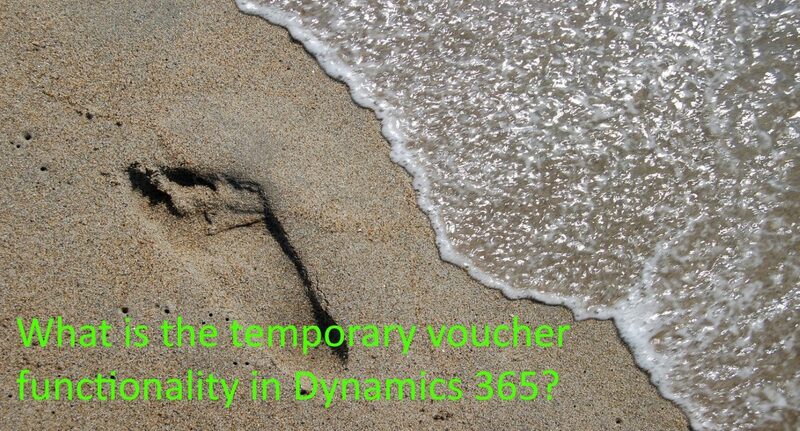 What is the temporary voucher functionality in Dynamics 365? 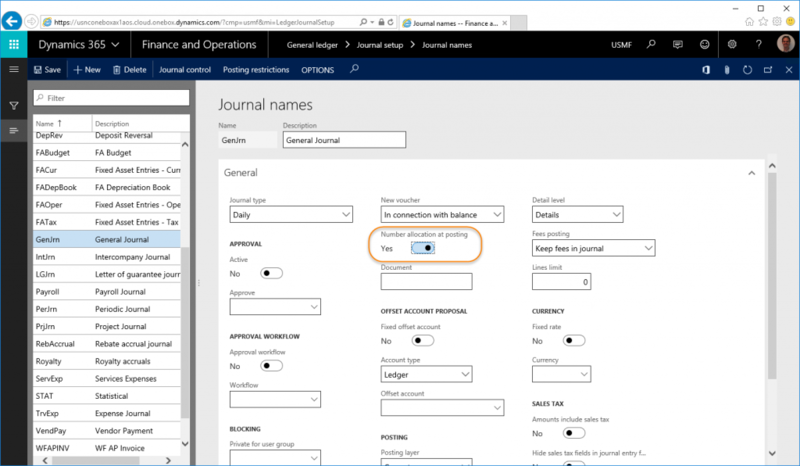 As of several versions of Microsoft Dynamics AX there is a feature to setup and use temporary vouchers for journal entry. 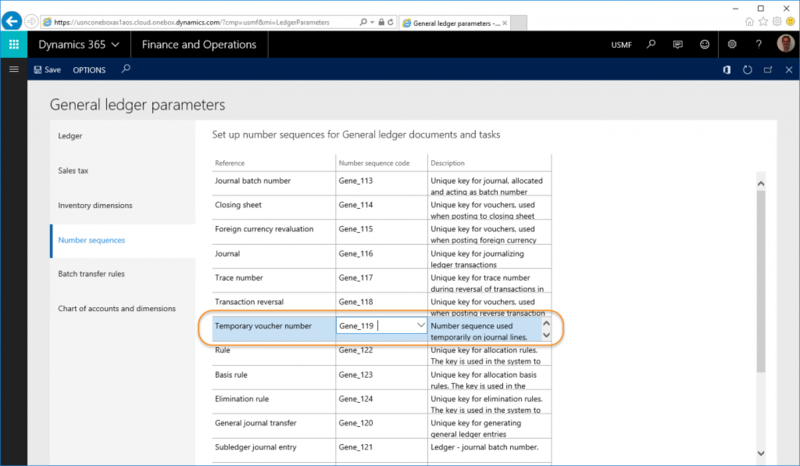 Also, this feature still exists in Microsoft Dynamics 365 for Finance and Operations, Enterprise edition. In this blog post I will tell you about the temporary voucher number and namely how you can benefit from this feature. There are countries/regions where it is mandatory to use continuous voucher series. While saying continuous, it should be really continuous. When you do setup a number sequence to be continuous it is still possible to get gaps in posted vouchers. A lot of accountants did complain about the gaps. A possible cause for these gaps can arise in the next situation. Assume user A and B are entering general journals. Voucher GJV0050 was the last posted voucher number. User A creates lines in a journal using the next voucher number: GJV0051, GJV0052, GJV0053 and GJV0054. User B also creates a journal with voucher numbers: GJV0055, GJV0056 and GJV0057. Now User B did check his journal and posted it. User A decides to delete the rows as he discovered the transactions were already posted before. Now we do have a gap in posted voucher numbers. For some countries/regions it isn’t a problem as it would be allowed to reuse the ‘gaps’. Some countries do have regulations that per period the numbers should not have any gaps, so using numbers GJV0051, GJV0052, GJV0053 and GJV0054 in a period later than the already posted numbers are not allowed. To overcome this issue, you can work with temporary vouchers. User A: TMP0078, TMP0079, TMP0080 and TMP0081. User B: TMP0082, TMP0083 and TMP0084. During posting the temporary voucher numbers are being replaced with the correct voucher series for the journal. So, when user B will post his journal, the vouchers will be correctly replaced with GJV0051, GJV0052 and GJV0053. Per temporary voucher number a new voucher from the series will be retrieved. As you will notice now, there are no gaps anymore in the real voucher series. There are two settings required to be able to work with temporary voucher numbers. The first setting is the Temporary voucher number sequence on the General Ledger parameters form. The second setting is the Number allocation at posting on the Journal names. Per journal you can decide to enable the use of temporary vouchers or not. When you do create journal lines, initially it will use the temporary voucher number as you can see in the next screenshot. During posting of the journal, it will replace the temporary numbers with the actual voucher numbers. When you have to work a lot with importing journal lines, it would be possible to use e.g. the Data Import Export Framework. Custom import scripts can also be used. In both ways, you have to take care of the correct voucher numbers. For these scenarios, also the temporary voucher is a great aid. You can provide manual assigned numbers in your source file which could be in fact also against the setup of the temporary voucher number sequence. Per journal you can start over with voucher number 1 if you want to. Whatever you provide, during posting each unique provided voucher number will be replaced with the final voucher number retrieved from the journal setting. If you imported lines manually and try to delete them as they were incorrect, there is a check if the temporary voucher number meets the format of the temporary voucher sequence. If it doesn’t match, an error will be raised. This error sounds odd as you only want to delete not posted journal lines. The reason for this is that if you did setup the temporary voucher number to be continuous, it should put the number in the pending number sequence list. That is not possible if the format is different. For this reason, probably avoid using formats for the temporary voucher series, so that the numbers will be natural numbers like 1, 2, 3, etc. There is one disadvantage to mention. If there is an error during posting, it will give you the error with the replaced voucher number. The error causes the journal lines to get the old values, so with the temporary voucher numbers. For this reason, it is hard to find the row(s) which contains the error in larger journals.